Crisp on the outside, moist within, and fancy enough to serve at any party, these potato puffs by James Beard Award-winning chef Hiro Sone are also a huge hit with kids and can be customized with a variety of additions and substitutions, such as minced cooked bacon, fresh herbs, or different cheeses. While they taste best freshly made, they’re still delicious when reheated in a 300°F oven for about 5 minutes or until warmed through. Preheat the oven to 350°F. Poke 8 to 12 deep holes with a fork all over the potatoes and bake for 1 hour or until cooked through. When the potatoes are cool enough to handle but still warm, peel, and rice or mash them. Place the potatoes, egg, baking powder, cornstarch, Parmesan, white pepper, salt, and cheddar into a medium bowl and mix well. Using your hands, roll 1 tablespoon of the potato mixture into a ball. Place it on a baking sheet. Repeat with the remaining mixture. Cover the baking sheet with plastic wrap and refrigerate the balls for 3 hours. In a small pot, heat enough oil so it’s at least 3 inches deep until it registers 330°F on a deep-frying thermometer. Fry the balls in batches until golden brown, about 2 minutes. Transfer them to a paper towel to drain the excess oil. 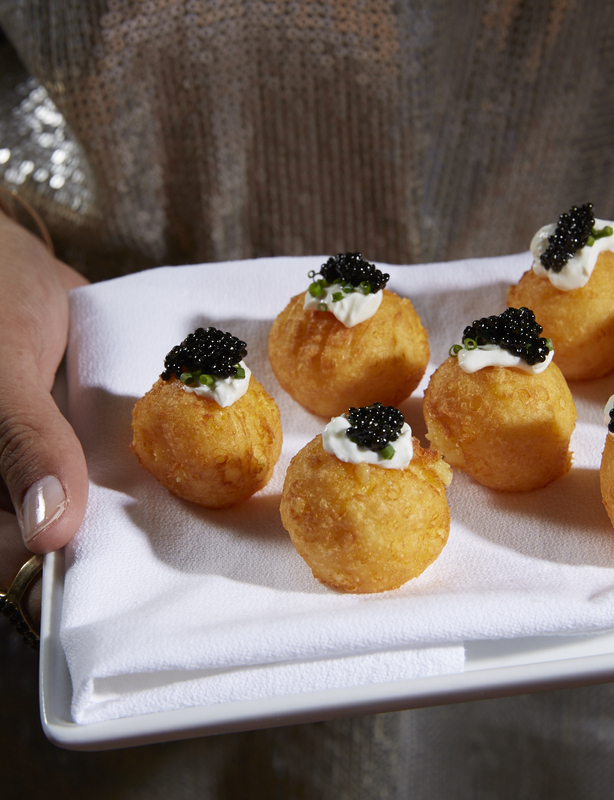 Serve hot, garnished with the sour cream and caviar if desired.